Finally finished building my CoreXY!!! I now need to order a new board a 0.8.5 or another compatible board with with the Duex4. I know that I could go with the WIFI but since I already have the Duex4... (next project using the diamond RGB...). Did you mill the aluminum top plate? I am thinking about building something very similar using the mecadunio extrusion kits where the belts are inside the T slot but with linear rails like you have done. Just one difference is that my build plate will be stationary with the printhead all on the xyz axes. The 4 corners of the Z will be linear rails as well. My top plate was CNC. to fit rails you don't really have a choice. For the part below, do not feel offended, I do not know your plan and I am curious by nature. For a CoreXY car you require 2 straps at 2 different highs, I used a twisted strap idea that was suggested by Filipe Campos in the RepRap forum (not my idea). 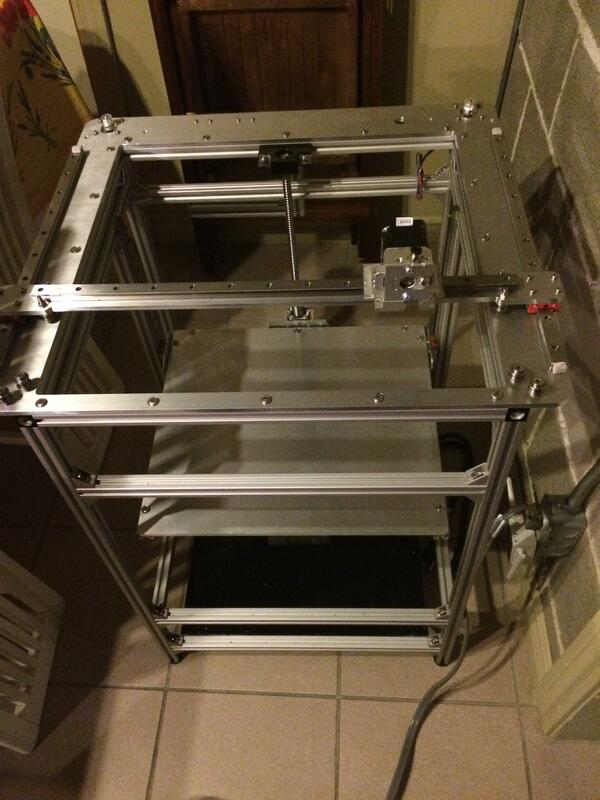 Can you fit 2 strap in the extrusion slot? For the rail at 4 corners, I am unsure if it's a good idea… rails are very good but also very stiff so IF everything is not well aligned, it might get stuck or cause resistance. I was "lucky" in that I was using some socket cap screws that the cap were long and they fit in the extrusion slot almost perfectly, made the alignment easier (on the heatbed). The only easy way with this would be to your whole support system milled or laser cut (can be expensive). If you plan to have you whole XYZ axis on your 4 rails you will require a ballscrew, the weight should be too much for a basic threaded rod (especially if you plan to have your top plate mounted on your rails. If you put the top plate within the 4 rails you will loose a lot of building room (at least the size of you car, hotend & strap system (if don't fit within slot). They did not use any rails or screws, all belts. They do sell plug and play electronics packages from CNCrouter parts but I went the custom route using Teknic Clearpath SDSK servos and UCCNC UC300ETH controller. Thank you for the intel, I like what I just saw. Mechadunio, not the same as the kit company… it is a board that turns an ordinary stepper into a servo. there is a thread on the google group where some Duet owners are working on implementing it. So far they report positive improvements over accuracy with a few issues like auto calibration to be worked out. another option i seen on a leapfrog at our local makerspace was a single motor driving a belt that ran 3 screws for the Z. it isnt a very accurate printer though and i have not yet dived into what needs to be improved on it. as far as screws bending, If done like the examples it should not matter. the screws are only a means to apply motion to the Z while the linear guides on 4 corners provide the stability. If you have a scew next to each guide it should keep everything in check. You can see this concept to the extreme if you research Project Escher and take a look at the commercial offering of Escher from Titan 3d…. that printer runs 4 independant xyz carriages over the top of a solid fixed build table. They do this with profile linear rails that the xyz carriages sit on and glide on. the motion is then done by having a servo attached to each side of the carriage with a 3 to 1 gear reduction pully which pushes the carriage along the screw. the screw itself in that machine is stationary, by not moving the same screw is able to be used to drive each carriage independantly.